You’re a talented writer, but we’ve done stories like these before. Your story doesn’t quite fit our line. Jamaica is a hard sell. All of the above are responses I received to various queries I sent out when I was first seeking publication. Of course, there were other queries that got no response, and then there were the letters sent to agents. However, it was the hard sell comment from a relatively well-known publisher that made me sit up and pay attention. In my arrogance, I figured that Jamaica was an easy sell based on the fact that so many people seem to see the island as exotic. I figured that I needed to go back to the drawing board, if this publisher was correct, and find another way around the mountain. I did a search of black publishers because maybe they’d have a better understanding of the experience of people of the same colour. The only barrier would be the cultural differences of people living on an island in the Caribbean Sea. In the back of my mind was also the thought that Jamaicans travel so far and wide that many people would have come in contact with a Jamaican at some time or another. I did my search and came up with a publisher I thought I’d work well with. They seemed to like the premise of the story I sent and asked for the entire manuscript. I heard nothing for maybe six months and decided to send a follow-up email. I was offered a contract for Contraband and submitted a second book (Dissolution), which also accepted for publication. And as if to prove that Jamaica wasn’t such a hard sell, another publisher offered me a contract on another book (Hardware). It’s interesting to note that the owner of that house is a Caucasian female who accepted the book on its own merit—cultural differences and all—for which I’m grateful. I know there are many other writers who have gotten hundreds of rejections in comparison to the few I’ve received, but my lessons learned include believing in my writing and listening to the opinion of experienced writers, solid critique partners and readers. I remember how discouraged I felt when I realized that no matter how well written a book, it won’t find a publisher unless they think they can do well with it in the market place. That said, self-publishing has opened the door to many writers who have great stories but can’t find a publisher. I have taken that route as well because of the control it gives me over my own work, but the best part is that I’ve seen way more on the Amazon checks than I’ve received in royalty payments to date. My best advice to writers? Learn the craft. Never give up. Never give in. Your day will come. Just write. The above reflection was my entry for the Overcoming Adversity Bloghop. 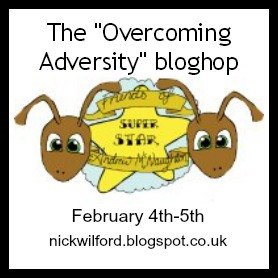 The aim of the blogfest is to write fact, fiction or poetry around the theme of overcoming adversity. The hop is hosted by Nick Wilford at Scattergun Scribblings. 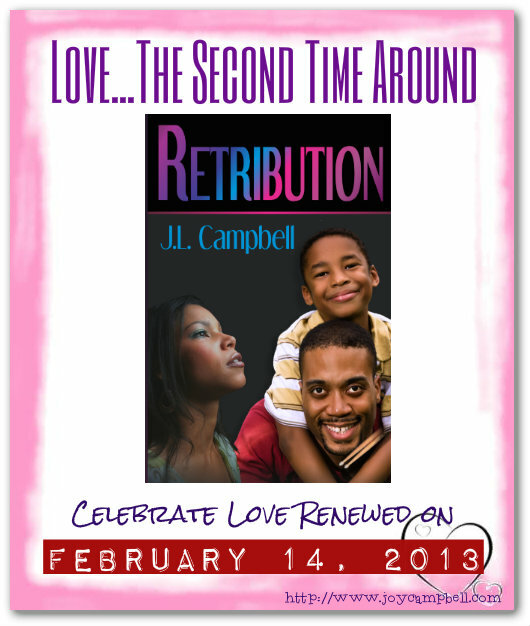 As some of you know, Retribution is out!!! 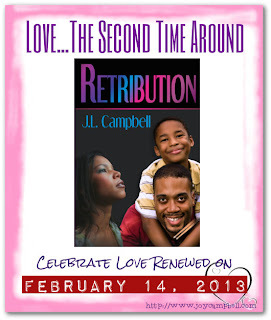 I’ve shifted my blogfest for Retribution down to February 14. The theme is Love...The Second Time Around. Write a fact or fiction piece of up to 500 words. We’ll vote on our favourite entries and the best fact/fiction will earn a $10.00 Amazon Gift Card. The linky list is here. Hope you'll participate and try your hand at writing a little romance!!! I so admire your tenacity and self belief Joy! Today it's about sellability! Thanks, Denise. When you get right down to it, publishers are in business to make money. I know Jamaica was a hard sell. But our country is still great. Nice entry J.L. Works for me, Loree, so I'm glad to share it. I love your story. And I love that you did research to try and find a fit. I keep hearing that you have to find the right agent/publisher, yet writers frequently don't do enough research to find out if they're even querying the right ones. It takes work, but it's important work. So true, Donna. I was just going after publishers of romance novels, but not zeroing in on what I should have at the time. Great to hear about the positive feedback you did receive! "Your day will come" is something my husband had to remind me of many times. Thanks, Isis. When there's nothing happening, it's hard to remember the day will come when you get a call or make the decision to publish. Excellent advice Joy! And you do work so hard. Thanks, Nas. Like anything else you get out of it what you put in. I love hearing people's road to publication stories. They're always so inspiring, and yours is no exception. Congratulations! Thanks, Max. So true. I read someone else story today as well. She's not published but is certainly on her way. I'm so glad things worked out for you! I fought the same kind of publishing battle--NA wasn't a "thing"--but it turned out okay. :) Onward and upward! I love your story of getting through adversity! Thanks, TGE. Haven't been over to your place in a while. Thanks for stopping in. I'll take that as something to remember. :) Don't forget to keep writing. True that, Kelley, we have to keep at it if we want to see our names on the covers of books. It's a shame that publishing is so dependent on perceived market trends. Jamaica is a great setting, but for me stories are about characters first, not setting. I'm so glad you didn't give up and got to where you wanted to be! Thanks for taking part in the hop! Good blogfest, Nick. In my books, Jamaica is also a character, which keeps me on my toes. I am fascinated with anything related to Jamaica. I'm also a Bob/Ziggy/Damian/Stephen Marley fan, so there you go. Good job not taking "no" for an answer! I loooove me some Marley music too! I figured that the response meant several things, including the fact that the publisher didn't know what to do with it. I love the Jamaica you present in your books. It sounds very exotic to me (although I was very disappointed in the fact that it's so closeted to gays). Ah well, I can read about it, even though I never intend to visit now that I know that fact. There are plenty of other places willing to take my money that would treat me with respect. You know it's not a perfect world and for some of us, it's impossible to live with other people's choices even if they never affect us directly. Such persistent persistence, well done. Stick to and believe! Thanks for sharing that J. L.! Nothing worth having comes easy. I remind myself of that all the time. Congrats! Your story gives the rest of us the courage to keep at it. Thanks. It's easy to get discouraged, so I thought I'd write this piece. This is a testament to your strong spirit and self-belief! There's a great message for us all. Like everybody else there are times even now when I think 'why bother', but I love writing so I press on. I think a lot of people think they can write a book and then that's all they have to do. Hard work, diligence and determination, as you have shown, are what it takes to make a success out of a writing career. Keep up the good work. Thanks for dropping in. I only realized the kind of work that had to be done when my book was close to the publication date. your research and perseverance paid off! wonderful!! Makes me wonder too. Guess maybe the niche market would be too small. who knows? No worries and yes, there's a lot to learn and I'm learning new things everyday.